Side-scroller sequel confirmed for Sony console. 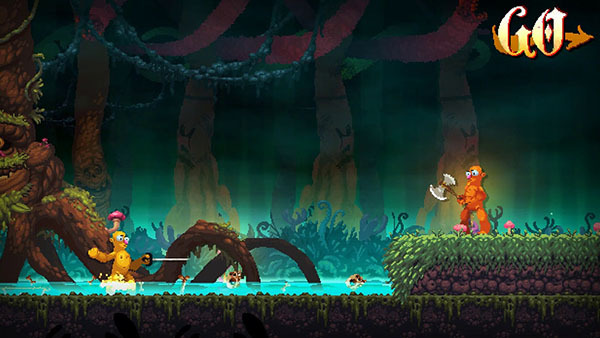 Nidhogg 2, Messhof’s side-scroller sequel announced for PC in September, will come to PlayStation 4 in 2017, the developer announced. The basic idea of the game sees two players face off with swords, and the winner of the duel is able to advance towards their side of the screen. The opponent will respawn in front of you and try to take back control of the camera though. If you make it to the end, you’ll be able to sacrifice yourself to a flying worm called Nidhogg. Nidhogg 2 offers new weapons like axes, knives, bows and arrows, and new arenas, an updated art style and animations, new soundtrack, and more.